Zoo Resort 3D for the revolutionary Nintendo 3DS is a really exciting game from Marvellous developments and released by Ubisoft.The game is very interesting and playable and takes you on a 3D adventure into the chaotic world of the Zoo. Graphics are good and so is the game play but I found it to be slightly predictable after a while which was a real shame. 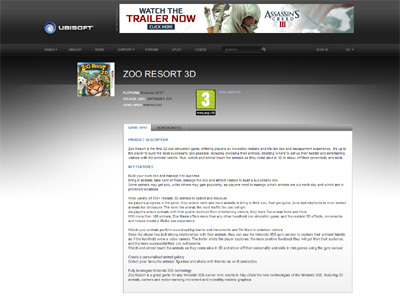 We have also compiled a Review System for this, of which Zoo Resort 3D is Rated as Three Stars, the third highest possible score available from the Game Review Team.